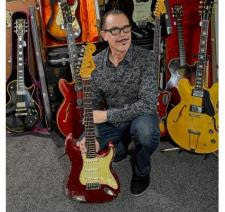 INXS co-founder Kirk Pengilly is auctioning off his collection of INXS instruments used to record classic albums like The Swing, Listen Like Thieves, X, Welcome to Wherever You Are and Kick. Many of the instruments in the collection have been played around the world on INXS tours. View The Kirk Pengilly (INXS) Collection catalogue online at Sotheby's Australia.